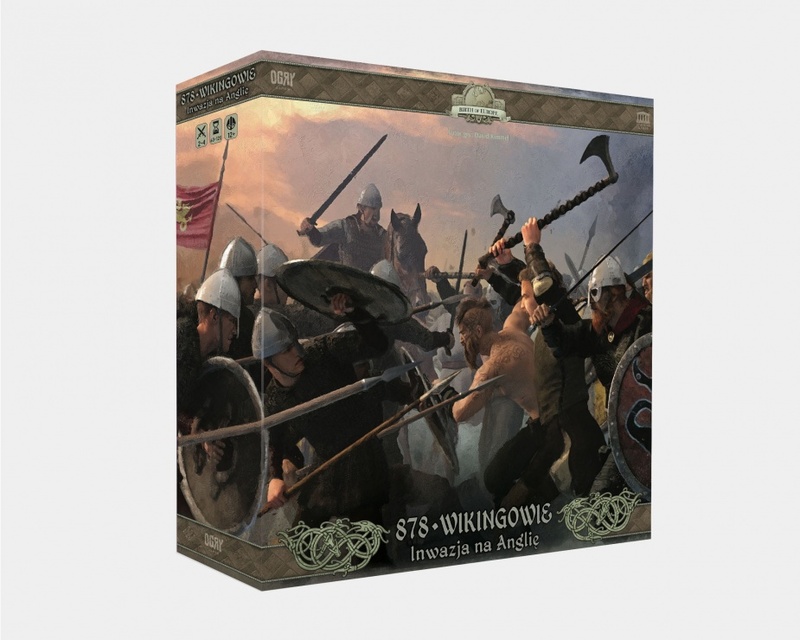 878 Vikings is an area control boardgame in which 2 - 4 players play as the invading Vikings or the English nobles who are trying to withstand the invasion. Viking players control the Norsemen Viking freemen and the fearless Viking shock troops known as Berserkers. The English control the King's Housecarls and the landholding Thegn noblemen. The mapboard represents the areas of England that were invaded by the Vikings in the 9th century. The English start with control of the entire continent, but every round, a new Viking leader invades from the sea and threatens to conquer England! Viking Leaders are a new addition to the familiar ruleset employed in the "Birth of America" series. Leaders bring huge waves of Viking Reinforcements, and they add exceptional mobility to invading Viking armies, allowing them to continue to battle and pillage as they move. Unlike the "Birth of America" games that 878 Vikings shares many of its rules with, army units are represented with unique faction miniatures. There are unique models for all four playable factions, as well as the “Fyrd”, the peasant militia units that rise up to defend their cities when attacked. All four factions and the Fyrd have their own combat dice. For each 'Hit' result rolled, an opponent loses one unit. For each “Flee” result rolled, you lose one of your units to the Fled Units box where it will return later as a reinforcement. For each blank face rolled, you have a 'Command Decision' and may use that to retreat a unit in the battle to an adjacent area. Each faction deck contains Event cards, Movement cards, and one Truce card. Every turn, each faction will play a movement card to maneuver their troops and zero, one, or two event cards. When both factions of a side (English or Viking) have played their truce cards, the game will end on that round! Each deck has a specific number of movement cards in it and managing them is an important part of the game. There are also special event cards that can be played on your opponent's turn, reflecting various historical events such as the conversion of some Vikings to Christianity or the infighting between various English kingdoms. As part of the "Birth of Europe" series, 878 Vikings brings the tried-and-true system of the “Birth of America” series to a new continent and era. 878 Vikings offers both simple and unique game mechanics, beautiful game components, and attention to historical detail and flavor. Ragnarok is coming!